Every time you connect to a server on the Internet, you automatically submit information to the server that may be used to for a variety of purposes. 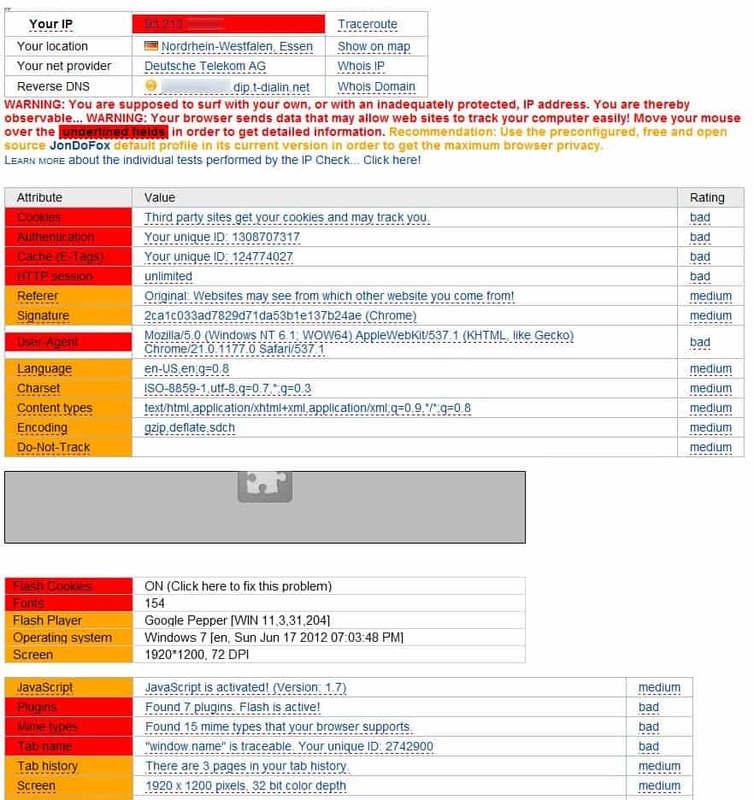 From creating a unique identifier and other tracking related activities, to malicious uses. The majority of websites are ignoring most of the information that are submitted automatically when the connection is established, others may use technical information like the screen resolution or web browser used to optimize contents for each connecting user. And then there are sites that record everything, for marketing reasons for instance. This can be done with simple means, and the data that can be collected this way is pretty extensive. It for instance identifies your IP address and with it your location in the world and your Internet provider. Websites also know the operating system and language, the web browser that is used for the connection, the version of the browser, the screen resolution, the number of installed fonts or the plugins that are installed and active in the browser. The IP-Check website displays all privacy information that it detects when you click on the test link on the main page. What makes this interesting are the ratings that it displays next to each entry, and the recommendations the service displays when you hover the mouse cursor over an entry. Some suggestions recommend to use JonDonym or Tor to hide many of the information that you would otherwise leak to the sites you are connecting to. Others tell you exactly what you can do in Firefox or Chrome to block the information from leaking. For the number of fonts for instance, the site recommends setting the browser.display.use_document_fonts parameter in Firefox to 0 to avoid this. This basically blocks documents from specifying fonts to use, which the suggestion fails to reveal. This highlights one of the issues that you may have with those suggestions. Another is that they usually only cover Firefox, and sometimes Chrome, and no other browser. Still, you could obviously research the topic on your own to see if there is a better solution for that issue. Or, you may simply come to the conclusion that leaking the number of installed fonts is not really that big of a deal. The website is pretty handy to find out what your browser reveals about you privacy-wise. Plus, it may aid you in resolving some of those issues without reducing the browser's functionality. While that is true for some of the suggestions, others can only be resolved if a setting is changed that may impact the functionality. I believe this site’s results are a little alarmist. It rates many things essential to having a fluid browsing experience as ‘medium’ in the risk category. I suppose for the ultra-paranoid this is useful, but for most people – if you disable too many options, you’re more likely to be frustrated by sites that don’t work right than by any violation of your privacy. If you’re online, your privacy is pretty much nil anyway. Just my two cents. Yes, very alarmist. I don’t even have Java, but it stilled flagged me. This is for people testing anonymity leaks. And being thorough is important. Very useful stuff, but the common user may be better off not knowing as they could easily get confused and unnecessarily worried. I do agree with your view, but still think that users should know what they reveal when they connect to a site on the Internet. As I said, it is up to the individual to make a decision what’s ok for them and what’s not. Most users will probably not mind at all, others might not like a few of the values, and the paranoid bunch might even want to eliminate all the information. There are some fields that will probably cause problems if you disable them (i.e. if you remove user-agent, the server will not know if you’re using IE, FF or any other browser and the site content will not appear correctly). There is also some kind of an agenda on this page (they want you to use some anonymizer software). This site is to recomend Firefox. Try it with IE and you’ll be recomended.